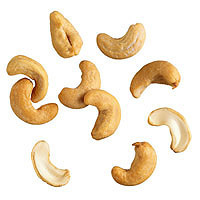 The most common variety of cashews is grown in India. Cashews are the edible seeds of a tropical and subtropical evergreen tree of the species Anarcardium occidentale. The species is related to the poison sumac and is native to Central and South America. It was brought to India and East Africa during the 1400s by Portuguese missionaries. The author could find no reference to other varieties. So, it seems that although it is grown in various parts of the world, the cashew is essentially a singular variety.